What Ashish Chugh is looking for in this market? It is important to know that as that can help us find multibagger of our own. He is a multibagger specialist. Some of his ‘pet’ stocks have delivered big returns over the years: Natco has surged 67 times in less than 10 years, Avanti Feeds has grown 60 times, or 5,900 per cent, in four years. 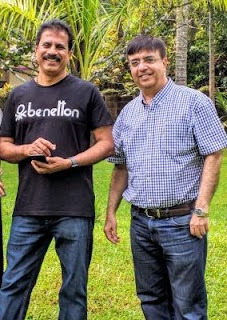 Porinju and Ashish Chugh (left). The thesis: as and when demand picks up or the teething issues get resolved, revenues and profitability shoot up substantially due to operating leverage. At present, Chugh is looking for stocks in sectors such as ancillaries to housing, infrastructure, building material and rural plays, where the demand pickup is due. “I am looking for select plays in cement and e-commerce segments, and in the microcap space. One more theme I am working on is companies with great brands and brand recall. They did not do well in the past because of change in business dynamics and may be restructuring or reinventing their business models. Value migration from unorganised to organised space post GST is another theme that interests me,” Chugh said. Read more: How Ashish Chugh search for multibagger stocks?